There's an exhibition about the almost 400 year old St Boswells Fair, also known as the Gypsy Fair in St Boswells, this weekend. On Friday, 18th July there's also a coffee morning from 10am to 11.30 am and a community lunch from 12 noon to 1.30pm. Everyone is welcome at these; they take place in St Boswells Church Hall. Approximate map. St Boswells Village Hall is on the corner of Main St and Jenny Moore's Rd, St Boswells, Roxburghshire, opposite the bus station. Approximate map. Admission is free. There’s a free colouring competition for children under 12 with book-tokens as prizes. We’ll have a stand with a display, books to look at and buy and we’ll be on hand to answer questions about family history. We would like to hear from you if you’re related to a gypsy family, if you want us to help you trace your family history or if you just want help with a brick wall. Tom Tokely’s talk begins at 3.30 pm on Saturday,19th July in St Boswells Church Hall and we’ll have copies of The Kirk Yetholm Gypsies by Tom’s late brother, Vic Tokely for sale at £2.75. There will also be gypsy artwork and miniature vehicles on display. There will be refreshments available until 4pm each day. Other exhibits are by the Hawick Heritage Hub, Police, Fire Service, NHS, Citizen's Advice Bureau. I understand the organisers, St Boswells Community Council, are looking for feedback on the event. Everyone submitting a feedback form has a chance of winning some carved wooden flowers donated by Blackie Lee, the husband of Tina Lee, who tells fortunes. 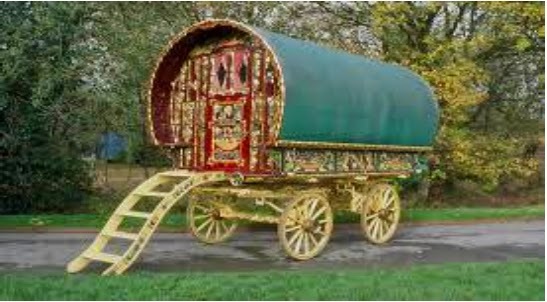 Don't forget to look on the St Boswells Green at the traditional gypsy caravan and perhaps have your fortune told.